Orthodox Jews in New York and Israel have been burning wigs made of Indian human hair after rabbis ruled they may contravene religious law. Hundreds gathered in the Brooklyn suburb of Williamsburg on Sunday to ignite a bonfire of more than 300 wigs. 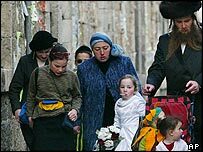 Orthodox women often wear wigs because custom requires that they cover their own hair in public once married. Indian wigs were declared non-kosher after Israeli rabbis discovered the hair was often cut at Hindu ceremonies. Orthodox law forbids use of any items used in what they consider to be idol worship. Last Wednesday, a revered Israeli Orthodox Jewish rabbi, Shalom Yosef Elyashiv, issued the ban on wigs made with the offending hair. In Israel, lists were drawn up of places where banned wigs were sold and, in the religious city of Bnei Brak, some people gathered up offending wigs and cast them into fires, Haaretz newspaper reported. Wig shops in New York City, with its large Orthodox Jewish community, are facing a similar concern. Owners said frantic customers have been phoning to check where their wigs came from. And some women have resorted to wearing less comfortable synthetic wigs or have adopted hats or hair nets. But it is not merely religious concerns that are prompting the panic - human hair wigs can cost up to $1,000 and it could prove expensive if a woman finds her wig does not conform to the ruling. Not taking any chances, Yaffa's Quality Wigs shop in New York left a recorded message on its phone, reassuring customers its wigs were "100% kosher".